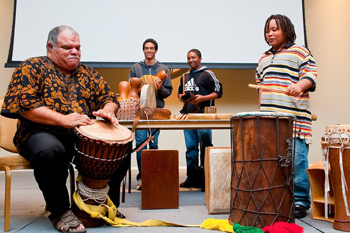 TAMPA, Fla. -- Hillsborough County students visited the University of South Florida’s Marshall Center on Jan. 20, to experience the cultural event “Many Faces of Africa” hosted by USF’s Department of Africana Studies and the Institute on Black Life. Barbara Lien, a teacher at Bowers-Whitley Career Center, brought students to the event as a reward for good behavior. Maritza Renteria, 17, is a student at Bowers-Whitley studying interior design. This was her first time attending the event, and she said she learned things about Africa that she did not know before. “I didn’t realize there are 53 countries in Africa,” Renteria said. Laura Glover, 17, is studying early childhood care at Bowers-Whitley. She said her favorite part of the day was the drum presentation when she learned that the drums were used as a form of communication among African communities. Amanda Zawacki, a seventh-grade teacher at Liberty Middle School, said it was a positive event for her students. Rodriguez said more schools were involved in this year’s event than last year. “As more schools learn about the event, more teachers want to attend,” she said. In future events, Rodriguez hopes to offer student workshops so the students can have more direct contact with the presenters.